Many of the Cortazzi ukiyo-e collection held at the Sainsbury Institute are Yokohama-e, or prints depicting non-Japanese foreigners. 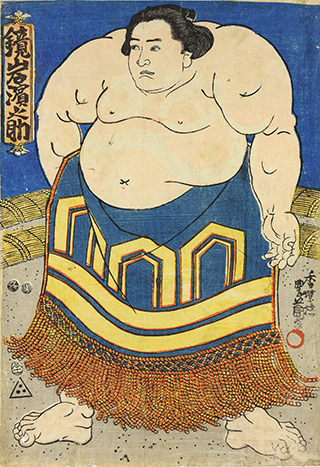 There are, however, some unique exceptions including Sumo-e or prints depicting sumo wrestlers. Sumo, as familiar to many, is a wrestling match that takes place on a dohyō mound. Two rotund yet herculean rikishi wrestlers battle out strength by forcing the opponent down to the ground or out of the circular ring. Recorded history of sumo dates back to early 8th century. The mention of sumo appears in Kojiki and Nihon shoki translated respectively as “Records of Ancient Matters” and “The Chronicles of Japan” (Yamada, 1982) and is said to have originated some 1500 years ago (Nihon sumō kyōkai). In the Heian period (794-1185), sumo was referred to as sumai no sechie and held as an annual custom. Sumo evolved in the medieval period and especially in the Kamakura period (1192-1333) where warriors rather than the traditional court nobilities hosted the matches. The warriors encouraged sumo as part of martial training. By the Muromachi period (1336-1573), there were individuals who took up sumo wrestling as a profession. In premodern times, sumo gained popularity as a vernacular spectator sport. In the early Edo period (1615-1868), sumo tournaments were held as public fund raising events in various regional areas especially in Kyoto and Osaka. This relates to Edo government’s policy of prohibiting the performance of sumo as entertainment, but allowing the matches to take place so long as the intention was to raise funds for key purposes such as to restore temples and shrines. Eventually, however, “fundraising” became more of a pretence. In actual practice, sumo was more akin to a show business. Violent fights instigated by hooligans frequently broke out. So much so that the government banned and had to crack down on illegal matches from taking place between mid 17th century and early 18th century. The government eventually permitted matches in Kyoto where they felt convinced that sumo would help raise vital funds. Such charity sumo matches were later reinstated in key metropolises, namely Kyoto, Osaka and Edo, from the mid-18th century onwards. Edo came to host two of the four annual tournament matches on the third and tenth months while Osaka hosted the fifth and Kyoto the sixth month (Sakai-shi Hakubutsukan, 1998). In the Kokushi daijiten (“dictionary of national history”), the tournaments are named after the four seasons and assigned to each city as “Edo (Spring and Winter), Kyoto (Summer), and Osaka (Autumn)” matches. Those who promoted sumo in the early Edo period were wealthy merchants in Kyoto and Osaka who used their financial influences to patronise the sport. They ploughed money into building stables filled with promising wrestlers from around the country and raised the popularity of sumo in Kamigata, or Osaka and Kyoto, area. By the late 18th century to early 19th century, Edo surpasses Kamitaga sumo. Edo stables were patroned by powerful daimyo warriors who were stationed in Edo for half of their career and used their influences to retain strong wrestlers. Sumo became one of the three major entertainements of Edo alongside kabuki theatres and the Yoshiwara pleasure district. It’s popularty spread from being the entertainment of the elite to the enjoyment of the many including townspeople (Takeuchi, 2002). “The three pleasures of Edo” (Edo sanpukutsui) by Katsukawa Shunkō (1743-1812) is a woodblock print that illustrates the three must-see performances of Edo. 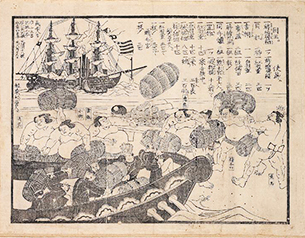 The print can be viewed from the Tokyo National Museum’s website. Similar to famous kabuki actors and beautiful courtesans as subjects in ukiyo-e prints, sumo wrestlers were also chosen to appear in illustrated forms. Prints depicting famous wrestlers and scenes of sumo matches lined the shops. Soon, sumo prints became established as its own unique genre called sumo-e. Katsukawa school was the most prolific in producing sumo prints, but in the 19th century, popular artists such as Toyokuni, Kunisada and Kuniyoshi from the Utagawa school of ukiyo-e artists also made sumo prints. Katsukawa school sumo prints often had a light beige colour background that gave a calmer pictorial impression. Comparatively, Utagawa school prints used vivid blues, possibly Berlin blue dye, that generate a more dynamic feel. It should be noted, however, that the background colours were by no means a signature of each school. In fact, there are examples where the Katsukawa school used blue while the Utagawa school had beige as the background. Sumo prints in the Lisa Sainsbury Library collection are mainly of Utagawa school’s work and those prints by the Utagawa school use blue as the background colour. Not all ukiyo-e scholars are enthusiastic about sumo prints. Yohsida Teruji, a pioneer of ukiyo-e scholarship, harshly criticises Utagawa school sumo prints as being “stereotypical and lack characer, dynamism and realism” in his Teibon ukiyo-e jiten (“Standard Ukiyo-e Dictionary”)(Yoshida, 1974). While Yoshida’s view is unsympathetic, it is nonetheless interesting to compare prints with actual photographs of wrestlers when possible. For example, the print of Kimenzan Tanigorō by Utagawa Kunisada depicts a popular wrestler active up until and just into the early Meiji era (1868-1912). Photographs of him also survive. In comparing the two portraits, the print aptly captures the protrusion of the chin and the sharp thin eyes together with the power and dynamism he exudes in the photograph. Kimenzan Tanigorō was born in 1826 in present day Gifu prefecture and made his sumo debut in 1852 in Kyoto. He moved to Edo the following year and rose to the top division to earn him a place as a retained sumo wrestler of Awa clan where he continued to succeed and earn the rank of Ōzeki. He was an imposing figure who towered at 186cm in height and 140 kg in weight (Yoro Town). He gained the title of Yokozuna in 2 Meiji (1869) at the age of 43 and is said have been the only wrestler to become a Yokozuna from Kyoto sumo stables and in fact first to become a Yokozuna in the Meiji era (Yokoyama, 1943). He is also the oldest at the time of gaining the Yokozuna title. He died at the age of 46. Another popular wrestler is Kagami’iwa Hamanosuke. In 1854, Commodor Perry’s American kurofune ships returned to Japan to negotiate the opening of her ports. As a diplomatic good will gesture, the Edo government sent a variety of gifts including 200 barrels of rice. Each rice barrel weighed around 60kg and the government sent two Ōzeki champion rank wrestlers: Kagami’iwa Hamanosuke, Ōzeki of the West (Osaka-Kyoto region), and Koyanagi Tsunekichi, Ōzeki of the East (Edo), who led a group of over 30 sumo wrestlers. 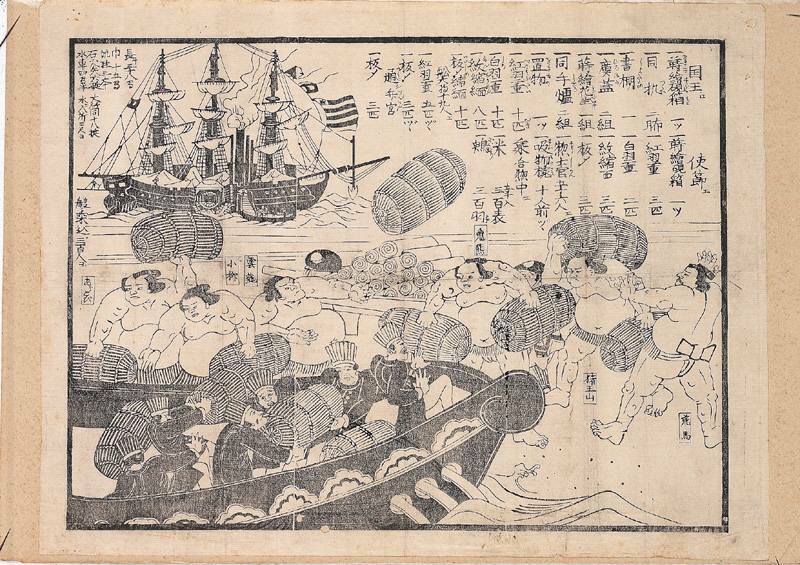 Each carried two to three barrels of rice in their arms and loaded Commodore Perry’s ship before performing sumo matches for the visiting Americans (Hagi Uragami Museum, 1998). 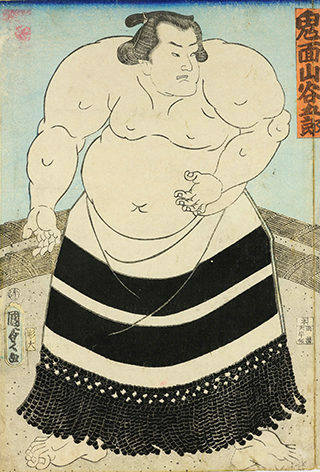 A print by Toyokuni III of Kagami’iwa Hamanosuke depicts the Kagami’iwa as a handsome giant with well structured body. He looked well suited to entertain the distinguished foreign delegation. Sumo prints, unlike mitate parody prints and egoyomipictorial calendar prints, are portraits without narrative twists or pictorial allusions. Some may find them rather unsophisticated. Indeed, the two prints introduced in this article may come across as portraits of large men where one is presented with an intimidating glare and the other as a gentle giant. However, viewing the prints together with recorded history of the actual wrestlers bring new life to these illustrated figures. They can all of a sudden appear more real and familiar. Toughts such as “isn’t it incredible to fight as a yokozuna in his 40s?” or “Kagami’iwa must have been proud to have surprised Commodor Perry’s men” may be evoked, which may in turn instil a sense of affection. By looking at the prints with historical narratives offer a unique and more personal way to relate to the figures depicted. Fortunately, abundant records of sumo wrestlers survive, unlike records of shop girls and courtesans who were sources of inspiration for bijinga or images of beauties. The records on wrestlers provide scholars with plentiful resources to research the printed subjects. Hagi Uragami Museum. Sumōe ten. Hagi-shi : Hagi Uragami Museum, 1998. Sakai-shi Hakubutsukan. Sumō no rekishi. Sakai-shi Hakubutsukan. 1998. Takeuchi, Makoto (ed). “Ōzumō no ōgon jidai”. In Bijuaru waido Edo jidaikan. Shōgakukan, 2002. Yamada, Tomoko. “Waga kuni ni okeru sumō hassei ni kansuru kenkyū”. In The annual report of researches of Otani University. no.34, pp.145-178, 1982. Yoshida, Teruji. Teihon ukiyoe jiten. Tokyo : Gabundō, 1974. Yokoyama, Kendō. Nihon sumōshi. Fuzanbō, 1943.